A hybrid cloud seems like the best of both worlds. You can protect your sensitive and mission critical applications in your IT’s private cloud, while outsourcing all non-essential data into the public cloud. Seems like a great idea, but how do you do it? How do you determine which data goes where? How do you manage both clouds efficiently? And what about security? 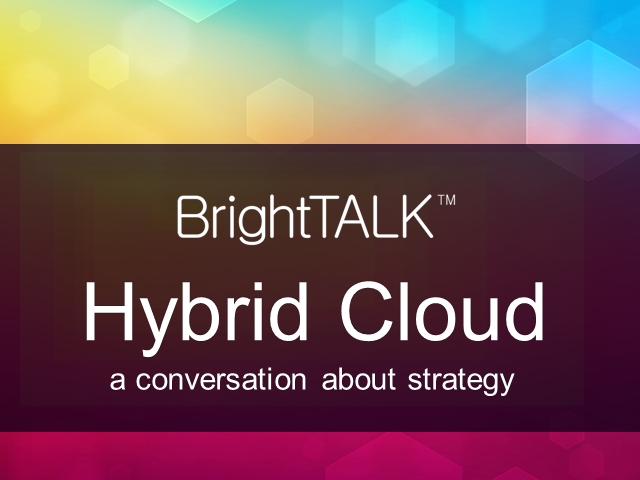 Join this panel of experts as they discuss whether the hybrid cloud is a panacea or another headache for IT departments. DMTF’s Platform Management Components Intercommunications (PMCI) Working Group develops standards to address “inside the box” communication and functional interfaces between the components of the platform management subsystem such as management controllers, BIOS, and intelligent management devices. Presented by DMTF’s Senior VP of Technology, Hemal Shah, this webinar will provide an overview of PMCI standards including Management Component Transport Protocol (MCTP), Platform Level Data Model (PLDM) and Network Controller Sideband Interface (NC-SI). The DMTF’s Redfish Specification, released in August 2015, takes a modern approach to systems management, using RESTful principles and focused on developer usability. Redfish’s data model differs from previous efforts by prioritizing end-user usability and scalability to enable management at the data center level. One key to the popularity of Redfish is the human-readable nature of the JSON resource payloads, which allow IT professionals and Dev/Ops alike to incorporate Redfish data into their management solutions. This presentation will describe the guiding principles used to define the standard Redfish schemas, and how interested parties can extend the Redfish model to encompass their own areas of expertise. Join DMTF VP of Technology Hemal Shah as he presents the applicability of existing and upcoming DMTF technologies and standards to Network Function Virtualization (NFV) infrastructure management. The goal of the OSDDC Incubator is to consider SDDC use cases, architectures and requirements. Based on these inputs, the Incubator has developed a white paper that reviews industry standards for the SDDC. This presentation will cover the current output of this DMTF incubator. This technically oriented webinar will walk through the resources represented in the Redfish 1.0 data model. Led by DMTF President Jeff Hilland, the session will use a mockup of Redfish JSON payloads to familiarize viewers with the base resource, major collections (Server, Chassis and Manager) and their components, as well as supporting services that are available through the interface. The Distributed Management Task Force’s (DMTF) Scalable Platforms Management Forum (SPMF) is working to create and publish an open industry standard specification, called “Redfish” for simple, modern and secure systems management using RESTful methods and JSON formatting. This session will cover the design tenets, protocol and payload, expected deliverables and timeframes. Join Hemal Shah, DMTF Senior VP of Technology, for an overview of DMTF management standards and how they address management needs of both software defined and traditional computing and networking environments. DMTF is an internationally recognized standards body focusing on manageability standards for everything from cloud and enterprise infrastructures to platform subsystems and components. DMTF standards are implemented in billions of machines and integrated into day-to-day cloud, enterprise, and networking infrastructure management. The latest release of the premier standard for delivering management information via system firmware, System Management BIOS (SMBIOS) Reference Specification, Version 3, extends support for 64-bit architecture systems. We will review each of the changes with the focus on the new 64-bit support for accessing SMBIOS data. Since its release in 1995, the widely implemented SMBIOS standard has simplified the management of more than two billion client and server systems. The Software Defined Data Center (SDDC) is a set of emerging technologies that are changing the way data centers are provisioned and managed. To that end the DMTF created the Open Software Defined Data Center Incubator to help develop an industry consensus on the definition and the technologies that may be needed to fulfill this vision. This session will discuss the recently released whitepaper from the DMTF Open SDDC Incubator that provides an industry view of where we are and the future of SDDC. The cloud computing market continues to grow as rapidly as ever and yet, only a small portion of the true value of cloud has been realized. Interoperability, portability and security are some of the biggest roadblocks slowing down the advancement of the cloud. The ability to port data, applications and share cloud services across multiple environments, while ensuring data protection and transparency is on top of every organization’s wish list today. A standardized set of principles can assist these organizations in utilizing the offerings of the cloud to the fullest. In this roundtable discussion, hear about the current state of cloud standards, the latest developments and how these changes affect your organization and the industry as a whole. Join this webinar live for an opportunity to engage in a discussion with the leading minds in the industry! Join the DMTF to learn about their recently announced initiative - NETMAN. This effort, which will unify network management, aims to provide the necessary standards-based management models and interfaces to enable consistent, unified and automated provisioning, deployment, configuration, and monitoring of network environments. Join DMTF President Jeff Hilland for an overview of the benefits of membership with the DMTF. Customers will not trust clouds to host their workloads and data without the ability to self-audit and monitor the provider’s platform and infrastructure. The DMTF Cloud Audit Data Federation (CADF) specification provides a comprehensive event model that can be used to solve this problem and prove compliance against corporate, industry or regional policies in any cloud deployment. This session will provide an overview of the CADF specification and how it has been successfully implemented in open source and integrated into the OpenStack IaaS platform. In addition, we will show how the robust CADF event format, besides being designed for traditional security auditing, can also provide accurate metering data that can be used for SLA monitoring, real-time analytics and problem diagnosis in cloud infrastructures. Join DMTF Chairman Winston Bumpus and other virtualization experts as they discuss the current virtualization industry. What's become standard? What's next? Why? Find out live by registering now. In this panel, we will discuss a number of Network Services Management use cases. Based on the requirements derived from these use cases, a series of policy and service management profiles are currently being developed in the Network Services Management WG of DMTF. An overview of these activities and relevant Industry/SDO initiatives (IETF, ETSI, etc.) and possible future work will be discussed in this panel. This session will present an overview of the DMTF CIMI standard for infrastructure clouds. We will present the model of resources that are available through the interface and the RESTful protocol for creating, reading, updating and deleting them. Example interactions using the interface will be drawn from the CIMI Primer. Cloud computing provides enormous benefit for organizations using it and almost everyone is taking notice. However, making sure you have a service level agreement in place that benefits you as much as possible is key to making it work. Join this panel of experts as they discuss what you should be asking when you evaluate cloud providers while negotiating your SLA. Storage Virtualization is used both on premise and in the public cloud, but what standards come into play? How can customers avoid being locked into proprietary interface? This talk will detail which interfaces are commonly used and what standards are emerging to ensure interoperability and data portability in the cloud. Mark A. Carlson, Principal Cloud Strategist at Oracle, has more than 30 years of experience with Networking and Storage development and more than fifteen year's experience with Java technology. Mark was one of the authors of the CDMI Cloud Storage standard. He has spoken at numerous industry forums and events. He is the chair of the SNIA Cloud Storage, NDMP and XAM SDK technical working groups, chairs the DMTF Policy working group, serves on the SNIA Technical Council, and represents Oracle on the DMTF Technical Committee and serves as DMTF VP of Alliances.